Hale-Genealogy.com : The Hale Family Of Highgate, Middlesex, England. Died about January 1777 in Highgate, Middlesex, England. Although there is no record at present linking William with Stephen, he may fit in here since three of his children were baptised in Highgate although born in St. Pancras and four more baptised in Highgate and born in Hornsey. Highgate Parish Baptism Register:- "Stephen of Stephen and Mary Hale, Hornsey"
The Holden Triennial Directory of 1805 - 1807, has "Hale, Stephen, watch and clock maker, High St., Highgate" who is probably this Stephen. Died between April 1739 - March 1743/44. Highgate Parish Baptism Registers:- "Thomas of Stephen and Mary Hale, Hornsey"
Occupation about 1804, Coachmaster previously Coachman. Married ELIZABETH DAY, 28th. August 1766, Saint Mary�s Church, Hornsey, Middlesex, England. Highgate Parish Baptism Register:- "John of Stephen and Mary Hale, Hornsey"
His Will dated 18th. October 1804, proved 7th. April 1808, notes his children as Thomas, William, Abraham, John, Elizabeth, and Mary wife of William Bowley. Also Elizabeth Hale wife of the above John Hale who died April 23rd. 1799 aged 60 years. Also Eliza Daughter of the latter who died August 12th. 1844 aged ... years whose remains are deposited near this spot. The Holden�s Triennial Directory of 1805 - 1807 give details of "Hale, Senr. Coachmaster, Southwood La. Highgate." Born about 1739 possibly in Hornsey. She may have had a brother Thomas Day who was buried on 21st. November 1818 in Highgate Churchyard according to Burial Index. "John Hale and Eliz. Day both of Highgate in this parish 28 Aug. 1766"
Highgate Parish Registers:- "William of Stephen and Mary Hale, Hornsey"
"Sacred to the memory of William Hale, late of Kentish Town, February 15th 1812, aged 71. The grave 14 feet in Front of this stone. Mr. James Downe Hale, son of the above, who departed this life on May the 8th. 1807, aged 31 years, The grave is three feet to the left of the above. also Catherine Hale who departed this life January 1822 aged ... Years. also Caroline Hale daughter of Joseph and Catherine Hale who departed this life August 26th.1838 aged 32 years"
Probably second wife as born after James Downe Hale. Buried about 19th. October 1820, Highgate Chapel, Highgate, Middlesex, England B.I. Died about 26 August 1838. Married MARY JAMES, 18th. April 1804, St. Pancras Church, St. Pancras, Middlesex, England. Buried 14th. May 1807, Highgate Chapel, Highgate, Middlesex, England. St. Pancras Old Church Parish records have James Doarn or Downe Hale with parents William and Mary. Highgate Parish Registers:- 1807 "James Dorne Hale aged 31 was buried May14"
Born 18th. September 1779, St. Pancras. Born about 25th. May 1795. Born about 26th. September 1797, St. Pancras. Born about March 1743/44, Hornsey. Highgate Parish Registers:- "Thomas of Stephen and Mary Hale of Hornsey, Shoemaker"
Highgate Parish records have a Thomas Hale, Coachman buried 6th. August 1779 who is probably this Thomas. He may have worked with his brother John in the Coaching business. Born about September 1745, Hornsey. Highgate Parish Registers:- "Elizabeth daughter of Stephen and Mary Hale, Hornsey, Baptised"
For more information about this Hale family e-mail Brian Jones. Married ELIZABETH SPEARING on the 29th. September 1803 at St. Pancras Church, St. Pancras, Middlesex, England. Inherited the Coaching business from his father. Highgate Parish Baptism Registers:- 1767 "William son of John and Elizabeth Hale of Hornsey Parish, Coachman, was baptised 16 Aug."
The Holden�s Triennial Directory of 1805 - 1807 give details of "Hale Wm., Coachmaster, Opposite The Grove, Highgate." Highgate Parish Burial Register:- 1807 "William Hale aged 39 was buried. May 31"
Also Mrs Elizabeth Hale Widow of the above who departed this life April 13th. 1853 in the 77 year of her age. Also William Hale son of William and Elizabeth Hale who died November 23rd. 1870 aged 65 years." Probably married to Elizabeth SKINNER at St. Pancras Church on 22nd. May 1794. Highgate Parish Baptism Register:- 1770 "John son of John and Elizabeth Hale of Hornsey parish, Coachman was baptised June 29"
The Holden�s Triennial Directory of 1805 - 1807 give details of "Hale John, Boot and Shoe maker. Opposite The Grove, Highgate." The St. Pancras Parish Marriage Register:- "John Hale Bachelor of this Parish and Elizabeth Skinner of the Parish of Hornsey, Spinster, were married in this Church by Licence this twenty second Day of May, One thousand, seven hundred and Ninety four"
Married SARAH DRAKE, 19th. July 1800, Hornsey Church, Middlesex, England. Refer to later Sections for details of them and their families. Highgate parish Baptism Register:- 1775, "Elizabeth daughter of John and Elizabeth Hale of Hornsey Parish was baptised Febry. 26th." Baptised 26th. September 1776, Highgate Chapel, Highgate, Middlesex, England. Married WILLIAM BOWLEY, on 21st. December 1799, Spitalfields Christ Church, Stepney, London, England. Highgate Parish Baptism Register:- 1776 "Mary daughter of John and Elizabeth Hale Baptised Septembr. 11th." Mentioned in the will of John Hale as son in law, husband of Mary Hale, Address: Bishopsgate Street, London, England, Occupation: Oilman. One of the Executors. The Holden�s Triennial Directory 1805 - 1807 has "Bowley, G & Son, oilmen and salters, 180 Bishopsgate Street, Without." The 1814 London Directory has "Bowley, Wm. Oil & Salt Importer, 17 Halfmoon Str. Bishops." The 1821 London Directory has "Bowley, Wm. Oilman etc. Halfmoon Street. Bishopsgate." Baptised about 21st. December 1801 at St. Botolph, Bishopsgate, London, England. Married "William Mayor of Compton Terrace"
Baptised about 28th. December 1808 at St. Botolph, Bishopsgate, London, England. Baptised 17th. May 1778, Highgate Chapel, Highgate, Middlesex, England. Inherited the Coaching business from his brother William. Highgate Parish Baptism Register:- 1778 "Abraham son of John and Elizabeth Hale, Coachmaster baptised May 17"
Also of Elizabeth Hardy, who died, June 9th. 1842, aged 57 years. Photographed from an oil painting at Lloyds. Died about 11th. November 1833, Palmers Terrace, Holloway, Middlesex, England. Thomas Hale's Will of 13th. May 1830, gives his Residence as Palmers Terrace, Holloway, Middlesex, ( England ) The will was proved on 21st. December 1833. The Indenture of Settlement has the date of his death as "on or about the 11th. November 1833"
The Post Office Directory of 1819 has "Thos. Hale, 12 Copthall ct., Throgmorton St. Merchant" and the Pigot directory of 1822 - 3 gives the same address. Kent�s Directory of 1828 gives "Hale Tho. Merchant, 17 Broad St."
The London Annual Directory of 1832 gives "Hale Thos. Merchant, 15 Old Broad St."
Died about 26th. May 1857. P.R.O. Deaths Index has "Hale, Sarah, W. Derby (reference) 8b / 314" in June � 1857. W. Derby = West Derby which includes Wavertree. Mary and Sarah Sophia Hale are mentioned as living in Wavertree in the Indenture of Settlement and later moved to their brother Abraham�s home in Pontefract, Yorkshire. Highgate Parish Burial Register:- 1807 "Thomas Hale, aged 6 years was buried September 10"
Noted in Old family tree as having died young. Information from Anita Vowles, née Hale, gives his approximate birth and death dates. Mentioned in Indenture of Settlement as having "died as an infant". Born 6th. April 1803, Islington, Middlesex, England. Married LUCY EASTON, 7th. November 1835, Hurstborne Tarrant, Hampshire, England. Buried in Highgate Western Cemetery, London, England, Grave No 11401, sq 62:- "John William Hale, 15.4.1886." St. Mary�s Church, Islington Parish Baptism Register:- May 1803 "Hale --- John William, son of Thom and Sarah, born april 6 ....bapt. 25"
P.R.O. Index has John Hale died at Croydon, age 83, June � 1886 Vol. 2a, Page 133. Buried at Highgate Cemetery, London England. He was a Member of Lloyds - Average Adjuster. 1839 Pigots Commercial Directory has "Hale Jno. Wm. Insurance Broker, 3 Whitelion Court, Cornhill. 1841, 1846,1848 and 1851 Kelly�s Directories have "Hale, John Wm. Average Stater , Lloyds & 1 White Lion Ct. Crnh." (Cornhill b.j.) In the 1851 Post Office Directory it has the same address and "Lloyds Register of British & Foreign Shipping, hours 10 to 5" at No. 2 White Lion Ct.
Baptised 26th. December 1805 in the Parish Church, Tisbury, Wiltshire, England. "Decr. 26 (1805) Lucy Dr. of Revd. Wm. Easton & Anna his wife". Died prior to her daughter Octavia�s wedding on 5th. September 1871 according to the wedding invitation. The 1881 Census has a Mary Hale born in Bishopsgate, Middlesex, Unmarried, age 75 (1806) living with Sarah S. Hale and brother in law Alexander Stanton, at 3 Sefton Road, Lower Babbington, Cheshire, England. Baptised 22nd. November 1807 St. Pancras Old Church, St. Pancras, Middlesex, England. Died about 23rd. May 1817, from Anita Hale. Married AMELIA PAIN ROWE, about 27th. March 1836. She was the daughter of Jonas Rowe, who died 11 July 1825, of Cannington, Somerset and Mary Rowe (nee Pain). i.	GEORGE STEPHEN STANTON HALE. iii. AMELIA MATILDA ROWE HALE. Refer to "The Family of Stephen Hale" in later Section. Married (2) LYDIA WOOD, about 14th. November 1832 at Hackney Parish Church. Married (3) JANE ANNA BLYTH, about 1st. June 1854, St. Martins Place, Norwich, Norfolk, England. Deaths notice " HALE.- On the 17th. inst., at Claydon, Suffolk, Thomas Hale, in his 84th. year. Funeral Claydon church, at three o'clock, on Friday, 20th. inst.,"
"For The Funeral of the late Thomas Hale of Claydon at Claydon Church, March 20th 1896. 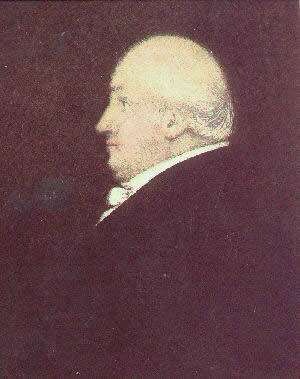 Husband of Lydia Wood and later Jane Anna Blyth." They had six servants in the house. Born about 11th. April 1812, possibly in Islington, Middlesex, England. Died about 14th. December 1847, possibly in Islington, Middlesex, England. Refer to "The Family of Thomas Hale" later in this Section. Baptised 21st. October 1814, St. Mary�s Church, Islington, Middlesex, England. Married ALEXANDER STAUNTON or STANTON, Bet. January - March 1841, Hackney, Middlesex, England. Elizabeth Hale married Alexander Stanton at Hackney in March � 1841 in Free B.M.D. Born 1st. May 1816, Holloway, Middlesex, England. Baptised 26th. May 1816, St. Mary�s Church, Islington Middlesex, England. Married ELEANOR POLLARD Between July - September 1841 in Pontefract, Yorkshire, England. Died between March and June 1903. Refer to later Section for the children of Abraham Hale and Eleanor Pollard. Baptised 3rd. November 1819, St. Mary�s Church, Islington, Middlesex, England. There is a Sarah S. Hale born in Holloway, Middlesex, Unmarried, age 61 (1820) living with Mary Hale and brother in law Alexander Stanton, at 3 Sefton Road, Lower Babbington, Cheshire, England in the 1881 Census. Born 17th. October 1836, Islington, London, England. Baptised 4th. July 1837 at Hurstbourne Tarrant, Hampshire, England. Parish Baptism Register 1813 - 1837 Entry No. 654 "July 4 (1837) Received into the Church, Lucy Daugt. of John William & Lucy Hale. Certified to be baptised in the parish of Islington , Middlesex & born Oct. 17 1836. (under fathers Quality, trade or profession) Gent. J. S. Gale Curate"
Died between October - December 1839, Islington , London, England. Died about 27th. February 1910, The Charterhouse, Clerkenwell. Born 5th. August 1842, 18 Park Place, West Islington, Middlesex, England. Buried 12 noon, Friday 13th. April 1917 at Highgate Cemetery of St. James. Residence 59 Argyle Road, Ealing, London, England. Cons Square 62, No. 37915. Name: Anna (Martha) Jones (Hale); Age: 58; Birthplace London, Islington; Living: London, Islington; Occupation: Living On Own Means. Married JULE M. ( JULIA ALFORD? ). Born between July - September 1844, Islington , London, England. Married (2) SAMUEL WILSON SUFFIELD. Samuel Wilson SUFFIELD, Married, Occupation: Commission Agent, Age: 42, Born: Handsworth, Stafford, England. Living at Mosley Wake Green, Yardley, Worcester, England. Refer to later family tree for more details. Married GEORGE DANIEL CHADWICK on 27th. July 1865 at St Marks Church, Follington Park, London England. Died between October - December 1861, Islington , London, England. Buried at Highgate Western Cemetery, London, England in Grave No 11401 sq 62. "Friends of Highgate Cemetery" letter of 19th. May 2004 to Anita Vowles gives details of the grave as:- Lucy M Hale buried, 1867, but probably wrong date. Born between October - December 1850, Islington, London, England. P.R.O. records have Octavia Anne Hale born in the December � 1850, Islington, Vol 3, Page 288 or 255. Married AMEDEE LOUIS EUGENE BARDEY, 5th. September 1871, St Marks Church. Follington Park, London, England. P.R.O. records have Octavia Ann Bardey died in the March � 1878 at Greenwich Vol 1d, Page 626, age 27. Buried at Highgate Western Cemetery, London, England in Grave No 11401 sq 62. "Friends of Highgate Cemetery" letter of 19th. May 2004 to Anita Vowles gives details of the grave as:- Ocharic A. Bardie,1878; but obviously wrong spelling. From the old Family tree she was born about 1869 and according to the 1881 Census she was born in Birmingham, Warwickshire, England and was the Stepdaughter of Samuel Suffield. Married L. ? JOHNSON according to old Family Tree. Born about 1877, Birmingham? Warwick, England according to 1881 Census. Married G. PRIEST according to old Family Tree. Married H. EAKINS according to old Family Tree..
Born between October - December 1872, Sutton, Surrey, England. The P.R.O. Index has a Mary Ann Bardey died at Islington, Vol. 1b, Page 228, December � 1874 who may be a daughter. Born between July - September 1876, Sutton, Surrey, England. Born between January - March 1878. Born about 27th. June 1867, Tottenham, Middlesex, England. Baptised at Hurstbourne Tarrant by Reverend Gilbert Adler from photocopy of Chadwick Family tree. Baptised at Hurstbourne Tarrant by Reverend Gilbert Adler according to photocopy of Chadwick Family tree. Died about19th. September 1896, Denver, Colorado, America. Married HENRY WALTER OSBORN, About 6 July 1901. Baptised at Hornsey Parish Church by Reverend Richard Harvey according to photocopy of Chadwick Family tree. Died about18th. March 1945 from photocopy of Chadwick Family tree. Born about 3rd. February 1872. Baptised at St. Paul�s, Islington in 1879 from photocopy of Chadwick Family tree. Married FREDERICK COMPTON, about 27th. July 1899, St. Bartholomews Church, Sydenham, England. Died about 8th. July 1892, Sydenham, London, England. Born about 31st. July 1882. Died about13th. February 1934 from photocopy of Chadwick Family tree. Refer to his details earlier in this section. Died 23 November 1883 in Croydon, Surrey, England. Born about 7 April 1843, 85 St. Jermyn Street, St. James, London, England. Born about 1st. August 1853, St. James Westminster. Born about 2nd. June 1841, St. James Westminster. Died about 9th. April 1940. Born between January - March 1869, Brentwood, Billericay, Essex, England. Died about 15th. November 1928. 1881 census:- Born: Deptford, Kent, England; age: 7; Occupation: Scholar; Relation: Daughter, John T. Pickering, (Head) Address: 70 Tressillian Rd., Deptford St. Paul, Kent, England; Film 1341166; P.R.O. ref. RG11, Piece, 0713, Folio, 103, Page 48. Died about April 1873, Camberwell. Born about 13th. January 1876, Greenwich, England. Note name in 1881 Census which is probably a translation mistake. THOMAS HALE (THOMAS3, JOHN WILLIAM2, STEPHEN1) was born about 23rd. May 1812, and died 7th. March 1896 in Claydon, Surrey, England. He married (1) JANE ANNA BLYTH. He married (2) LYDIA WOOD about 14th. November 1832 in Hackney Parish Church. Born about 5th. September 1833. Artist of Oil Painting etc. Born about 10th. November 1834. Married Alexander J. Wright on 12th. November 1856 at Christ Church, Highbury, London, England. Died about 8th October 1908. "died aged 73 interred at Manor Park Cemetery Tues 13th Oct. 1908"
Born about 6th. January 1839, Islington, Middlesex, England. 1881 British Census:- 7 Buckingham Road, Brighton, Sussex, England. Died about 9th. September 1847. P.R.O. Index has Thomas Hale born June � 1840, London II / 160 and Thomas Hale born June � 1840, Bloomsbury 1 / 65. Either might be this Thomas. Born about 11th. February 1842, London, England. Died about 17th. May 1924. Born about 15th. August 1843, Possibly Chelsea, England. Born about 18th. December 1847, Islington. Born between October - December 1852. She married JAMES EDWARD CRABTREE between April - June 1871 in Pontefract, Yorkshire, England. P.R.O. Index has ELEANOR ELIZABETH Hale born December � 1852 in Pontefract ref. 9c / 67. Born between April - June 1861, Pontefract, Yorkshire, England. P.R.O. Index has Maria Louisa Hale born June � 1861 in Pontefract ref. 9c / 95. Born between January - March 1868, Pontefract, Yorkshire, England. P.R.O. Index has Frederick Edmund D. Hale Born March � 1868 in Pontefract ref. 9c / 86.